Horror Director Eli Roth (Hostel, The Green Inferno) foregoes his usual macabre blood and guts for kid-friendly fare. The House with a Clock in Its Walls is a period magical fantasy with a tinge of darkness. It is the film adaptation of the classic John Bellairs novel; the first in a series of popular books with boy-hero protagonist, Lewis Barnavelt. The House with a Clock in Its Walls achieves an eerie look, but is fitfully dull in the first two acts. It picks up quite a bit of steam in the climax. The mystery takes shape in an interesting way, only to be squandered in a lackluster finale. The House with a Clock in Its Walls opens in 1955 New Zebedee, Michigan. 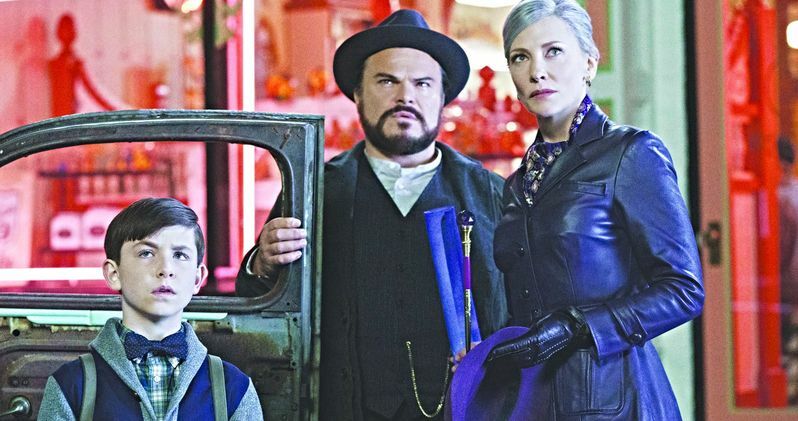 Recently orphaned Lewis (Owen Vaccaro) has to come to live with his mysterious Uncle Jonathan (Jack Black) in a creepy victorian house. The bookish Lewis, who also wears goggles on his head, is terrified of the place. There are clocks everywhere. The stained glass windows seem to move. Bizarre mannequins, dolls, and trinkets line every corner. At night, Lewis hears an ominous ticking behind the walls. Jonathan has an eccentric companion with whom he constantly bickers. Mrs. Zimmerman (Cate Blanchett), always elegantly dressed in purple, is a neighbor who spends more time in their home than her own. Jonathan and Mrs. Zimmerman are searching for something hidden in the house. Lewis discovers they are both powerful magicians. He begs to learn to sorcery and prestidigitation. Lewis must hone his magical skills quickly. Jonathan's evil nemesis, the house's true owner, has deadly plans for them all. Eli Roth delivers on style, not nearly as much substance. The House with a Clock in Its Walls has the haunted house theme down pat. Everything about the setting is well conceived. The place is spooky as hell. If only the plot weren't so plodding. The film fails to captivate in the beginning. The characters, particularly Lewis, are just going through the motions. The House with a Clock in Its Walls doesn't grab you like a Harry Potter film. Roth needed to craft the opening scenes with more wonder. Part of being a great children's film director is the ability to stoke curiosity, establish a sense of innocence and adventure. Roth's approach is too adult here. Star power can make up for a lot of deficiencies. Jack Black and Cate Blanchett are supremely likeable as usual. Black elicits a few giggles with his trademark mischievous grin and goofy antics. Blanchett always has a twinkle in her eyes. The film alludes to her character being a Holocaust survivor. She plays Mrs. Zimmerman as wounded, but quietly strong. These subtleties will go over the heads of children, but adds depth to her colorful character. From Universal Pictures, The House with a Clock in Its Walls strains to keep your attention throughout. Eli Roth knows how to stage a dark setting, but needs work directing from a child's point of view. That said, I applaud this first effort in the PG rating. Roth is branching out creatively. He can build on this experience and be better in his next family outing. Will House with a Clock in Its Walls Crush The Predator This Weekend?